Welcome today to the book tour for Grace Doll by Jennifer Laurens. 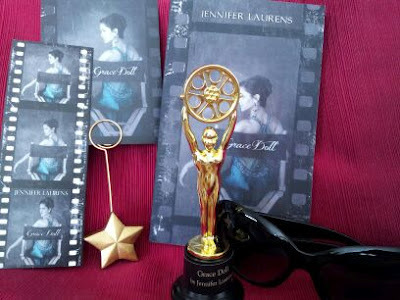 I have my book review , insight into how Jennifer created Grace Doll and wonderful Giveaway ! My first job was at 20th Century Fox Studios - on Dallas. It was a rainy day, and I wasn't sure HOW I'd get INSIDE the studio. Did I need a pass? A golden key? Would I be frisk searched? Surely there'd be serious security. After all, some of our biggest Hollywood stars were at work within the hallowed walls of the studio. My 'chair' in one hand, ( every background player carries his own portable chair to and from jobs so she has a place to sit during the long tedious hours between shots ), bag of makeup and junk in the other, I walked right past the guard station with a smile and onto the lot. No one asked me anything! No one stopped me. I was shocked. I found the sound stage and had my first day of many working in the fabulously exciting world of show business. I did this for 3 1/2 years, meeting so many interesting people, seeing so many bizarre, fascinating, unbelievable moments that I stored them all in my head, knowing someday I'd have to write them down. At first I was intrigued by the business--the way it took HOURS to shoot five minutes of footage. The politics of it all--every aspect of the business was interesting. I studied old Hollywood, comparing it to the Hollywood I was working in. Little things came to light such as when I stood in for Julie ( Lauren Tewes ) On the Love Boat, and when it was "Disembarking Day" we background folk all stood on deck waving to nobody ( except a bunch of bored workers off set ). Or when there was a closeup of Julie's hand and someone elses hand was used so Lauren could go home. I saw Divas and lecherous men. I worked under the nose of big-time producers and always marveled when someone would say to me," I'm coming to Hollywood to be discovered. All I need is to be seen..." Hopefuls had no idea how many people producers 'saw' every day--people with their foot in the door who never progressed beyond the background. Gorgeous, talented people willing to do ANYTHING for five minutes on film. I'd smile at the hopeful and say, "Good luck." Some of my best pals were the makeup artists and hair people, camera men and stage-hands. One makeup artist in particular was very fond of me. He had a son who worked background with me, and their quiet relationship was part of the inspiration for Grace Doll. The other inspiration was my own distant relationship with my dad--my feelings for him playing out heavily in Brenden's attitude about his dad. Grace Doll was my dad's sister. Her name was so different, any time we went anywhere together, or anyone spoke of her name, people were like, 'What?" It was the perfect name for my character. Many elements of my life weave into my work and Grace Doll is no different. Writing is therapeutic for me, so it doesn't surprise me when my characters feel a certain way. Writing is my safe exploration of fantasies often unrealized. My hope is that the reader who is in "paranormal, vampiric, shape-shifters overload" will enjoy something out of the ordinary like Grace Doll. Maybe readers will enjoy a trip to Hollywood fantasy land--like I did. I’ve now read Grace Doll twice, and must say I was just as eager the second time around to read it. I was pulled into the pages, and entranced in Grace's world and story from the very first page. Jennifer Laurens has taken us on a different path with Grace Doll, slightly darker than any of her previous books. The story concept only, I found it intriguing and mesmerizing till I Turned that last page. 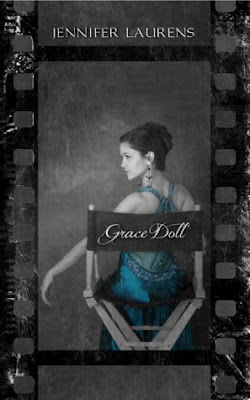 Grace Doll is every girls dream, Young, Beautiful, Talented and loved. A wonderful career ..... Even some may say, Loved to much. Rufus was every girl’s nightmare, dominant, demanding and possessive, to the point of wanting his Doll Forever Flawless, Forever young and forever his. Rufus decides he wants to give Grace a gift for eternity - he puts his plans in motion for his Grace Doll to be his for all immortality. HIS LIVING DOLL. Unaffected by age, Forever his beauty. At a young age, Grace was given the chance to shine - sizzle and be a movie star. Upon Meeting Rufus her dreams were met, but with harsh consequences. Grace became his possession, his obsession - his to deal with as he pleased, and in time, Grace no longer wanted to be his Living Doll. His controlling nature and ways was not the life Grace wanted for herself. A night that was meant to be her way out, ended up being a sentence. A life in hiding, from the evil that hunted her. 80 years later - Destiny came knocking at her door. Wow - I’ve read this book twice and I’m sure I read it in record breaking time both times. Second time around I think I was even more excited to see the edited copy and the extra’s that Jennifer added it. (( This will be an added extra for the readers )) grins. A compelling storyline, with crisp dialogue that was fluent flowing, filled with twists and turns, and suspense that will keep you eagerly flipping till the last word. The plot is intricate, intriguing, and solid. Giving the reader many thoughts along the way, a story that was definably unpredictable. The emotions that Jennifer has put forth In Grace Doll, I’m sure are beyond words. As the reader I can feel everything that Grace felt, the hurt, hate, horror, and love. At times, you will be taken aback by Grace's life, what Rufus put her through - and as a mother - My heart was aching for what poor young Grace went through at the hands of an older man. Can someone be loved too much?? In Grace's case yes... He possessed her in every way possible. The animal and abusive man that he was portrayed well, and instantly as a reader I disliked him from the very first pages. Cringing along with Grace as I read about her life, I was unsure where the story was headed but eager to find out if she escaped Rufus's evil demands and clutches. I loved the way in Which Jennifer put forth all her vivid descriptions, giving the reader every detail possible to see what is happening within the pages. So fluent - so detailed ...... it’s like your peering through a looking glass watching the story unfold. The characters are all defined well, with depth and definition. Villains we all wanted to see vaporized, the bad portrayed at exactly that, the kindness and love of others shone from the pages. We see Grace change along the way - from a timid young girl to a young girl with a mature mind. This will make more sense as you read on. The chemistry and passion between Brenden and Grace was sizzling, not just because of Grace's circumstances, but because they both felt that connection. Brenden was a character that I easily fell in love with, caring and considerate and honestly innocent. Despite his upbringing and the hurt he felt, he found it within himself to Give Grace a chance. Even though beforehand he has other ideas. As the suspense builds throughout the story, I felt like I was holding my breath just waiting for what was to come next. Grace Doll is a well-paced suspense-filled with a story that will leave you breathless and many a heart stopping scenes to leave your heart sagging – yet also relieved. If you are viewing the kindle version make sure you click on the link titled GRACE DOLL HAPPY ENDING for the link ;) its after the Vanity Fair article on the last pages.. I probably would because I would like to see how everything changes over time. I would definitely miss my family and friends though. I think I might choose it because there's so many things that i want to do that I feel I never have enough time for. I know that I would miss my friends and family though. I don't think I would choose immortality because I would out live all my friends and family.. that would be very lonely. I would only choose immortality if my family were immortal as well, because I couldn't bear to see them die while I lived on. Yes I would. I would love to see how the world changes and to have the most awesome TBR list ever.